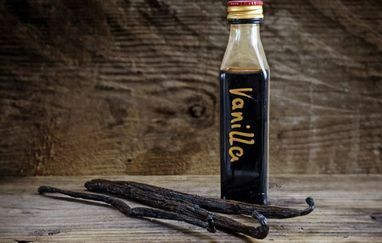 Split the vanilla beans in half lengthwise. Scrape the seeds from the bean using a knife, and place both the seeds and the beans in a glass jar with a lid. Warm the vodka to 100-120 degrees Fahrenheit. Pour the warmed vodka over the beans and allow to cool to room temperature. Once cooled, seal the jar. Store at room temperature for one week, shaking the jar every other day. Strain the mixture, then store in a sealed container. Flavoring will keep for a year, but chances are you'll use it up before then. Makes 48 one teaspoon servings.